01/12/18 BMW of north america, llc (BMW) is recalling certain 2018 230i, 230i xdrive, m240i, m240i xdrive, m2, and x3 xdrive 30i sav vehicles. these vehicles may have an error in the software for the instrument panel, causing the display to not properly illuminate. as such, these vehicles fail to comply with the requirements of federal motor vehicle safety standard (fmvss) number 101, "control and displays." 10/06/17 BMW of north america, llc. (BMW) is recalling certain 2012-2013 BMW x3 xdrive28i, x3 xdrive35i, and m6 convertible vehicles and 2013 m6 coupe vehicles. the affected vehicles have a driver's frontal air bag inflator that may have been improperly welded. 11/01/16 BMW of north america, llc. (BMW) is recalling certain model year 2015 BMW x3 sdrive28i, x3 xdrive28i, x3 xdrive35i, x3 xdrive28d, x4 xdrive28i and x4 xdrive35i vehicles, and model year 2014-2015 x5 xdrive35i, x5 sdrive35i, x5 xdrive50i, and 2014 x5 xdrive35d vehicles. the affected vehicles have a driver's frontal air bag inflator that may have been improperly welded. 12/16/14 BMW of north america, llc (BMW) is recalling certain model year 2015 x3 and x4 sports activity vehicles manufactured july 28, 2014 to july 29, 2014. the affected vehicles may have been produced with a driver's side exterior rearview mirror that was designed to meet non-us market requirements. thus, these vehicles fail to comply with the federal motor vehicle safety standards no. 111, "rearview mirrors." 12/11/13 BMW of north america, llc (BMW) is recalling certain model year 2013 x3 xdrive 28i/35i vehicles manufactured february 11, 2013, through february 27, 2013. due to a production process error, the tear seam on the instrument panel was not manufactured correctly. 12/31/69 BMW of north america, llc (BMW) is recalling certain 2006-2010 BMW x3 2.5i, x3 3.0i and x3 xdrive30i sports activity vehicles. the front passenger seat occupant detection mat that determines if, and how, the passenger frontal air bag should deploy in a crash may fatigue and develop cracks which could lead to a system failure. BMW will notify owners, and dealers will replace the front passenger seat occupant detection mat, free of charge. interim notices informing owners of the safety risk are expected to be mailed november 20, 2017. owners will receive a second notice when the remedy becomes available. owners may contact BMW customer service at 1-800-525-7417. 10/11/16 Suspension and Steering BMW of north america, llc (BMW) is recalling one model year 2017 BMW x3 xdrive 28i vehicle manufactured on june 7, 2016. this vehicle has electronic power steering (eps), and the contact pins on the eps control unit may not have been welded properly resulting in increased resistance. 08/10/11 Suspension and Steering BMW is recalling certain model year 2011 x3 passenger vehicles manufactured from april 27, 2011, through june 8, 2011. a control module in the electric power steering (eps) unit may malfunction, resulting in a sudden loss of power steering assistance. 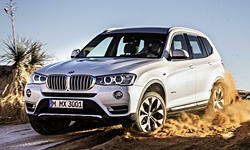 BMW will notify owners and dealers will repair the vehicles free of charge. the safety recall is expected to begin during august 2011. owners may contact BMW customer relations and services at 1-800-525-7417. 12/11/13 Electrical and Air Conditioning BMW of north america, llc (BMW) is recalling certain model year 2013 x3 xdrive 28i/35i vehicles manufactured february 11, 2013, through february 27, 2013. due to a production process error, the tear seam on the instrument panel was not manufactured correctly. 04/27/18 Other BMW of north america, llc (BMW) is recalling certain 2018 BMW x3 xdrive30i and x3 m40i vehicles. the rear spoiler may not have been properly attached during assembly, or may be missing screws, possibly causing the spoiler to detach while driving. 07/13/16 Other BMW of north america, llc (BMW) is recalling certain model year 2011-2017, x3 sdrive28i, x3 xdrive28i and x3 xdrive35i, vehicles manufactured july 2, 2010 to april 14, 2016, 2015-2017 x3 xdrive28d vehicles manufactured march 10, 2014 to march 31, 2016, and 2015-2017 x4 xdrive28i, x4 xdrive35i and x4 xdrivem40i vehicles manufactured march3, 2014 to april 15, 2016. the affected vehicles have lower anchor bars for securing child restraint seats that may become damaged when using the european-isofix-type, rigid-style connector, child restraint system.